You can agree or disagree with their view of the world, but I don’t think you can fault them for having a values-based way of making decisions about this sort of thing. I like the idea of being in control of the technology you use rather than the other way around. Are you in control of your TV? Are you in control of your inbox? Are you in control of your mobile phone? If you answered ‘yes’ to that last question, do you take your phone with you to face-to-face meetings? And if so, do you answer it when it rings? Is your use of all of these technologies mindful, or did you just fall into it? What criteria do you use to decide when to start using a new technology? Sometimes, I reckon, it’s good to step back and think about these things. 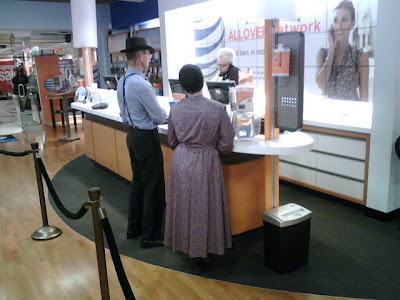 With this in mind, I wonder what the Amish make of blogs? Like wearing a shirt with buttons, I suspect they would consider writing a blog much too “prideful”. Hmmm, interesting thoughts re: technology being in control of us. I remember seeing a tv interview years back with the leader of an Amish village. He explained why they had a telephone box way down the end of their village street. The logic being it was there if it was needed, but if it rang during dinner for example, it wouldn’t disturb them. That’s a pretty cool boundary to have in place. Don’t know if i’d cope!